Welcome to the custom binders glossary. You might be a pro already. Maybe you’re looking at ordering your first set of custom binders. Whichever side you find yourself on now you’ll be in the know when talking to your rep.
(#) Ring | Amount of rings found inside a binder. You can usually find the ring on the spine or back of the binder. Angle D-Ring | Resembles a slanted letter D.
Back Bone | Term for the spine of a ring binder. Back Cover | Back of the binder. Bleed | The area of an image or graphic that goes outside of the actual end dimensions. A bleed is required for trimming graphics. Board | Ranging from multiple materials and thicknesses, the board is the main component of a binder. Capacity | The amount of text (in inches) intended to be placed into a binder. Center-to-Center | The measurement from ring-to-ring on a binder mechanism. For example, on a standard 11 X 8 ½” ring mechanism, the rings are 4 ¼” center-to-center. 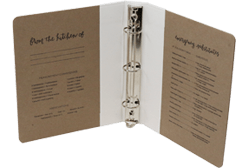 Clear View Binder | Cost-effective binders featuring clear plastic sleeves around the front and back covers along with the spine where you can insert printed sheets as needed. 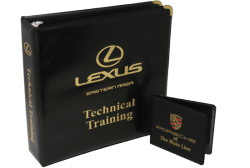 Ideal for instruction manuals as well as reports, presentations, and proposals. 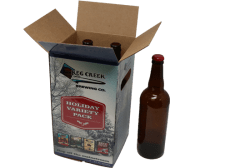 Cold Crack | The cracking if vinyl products when they’re exposed to a cold temperature for a certain period of time. Click here to read more. D-Rings | Shaped like a D. Typically used for holding larger quantities of sheets. Sizes range from 1” to 4”. Choose between an angle d-ring or straight d-ring. Debossing | Pressing a metal plate etched as your logo causing a depression onto your product. Dies | Tool used to create a desired cut or shape. Eco-Friendly Binder | Acid-free chipboard binders made with 100% recycled content with no cover materials or liner. Ideal for corporate communications and proposals. 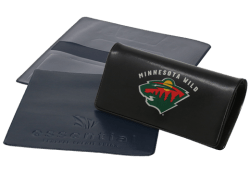 Embossing | Utilizing stamping dies to create a raised look on logos and letters onto your product. 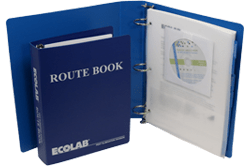 Encapsulated (Entrapment) Binder | Printed sheets permanently sealed between layers of crystal-clear vinyl encapsulated around the whole binder. 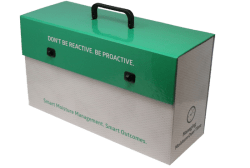 Ideal for document storage, portfolios, presentations, and training materials. Front Cover | Front of the binder. 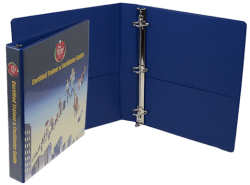 Index Allowance | The additional space needed to accommodate index tabs. Usually ½”. O-Rings | Shaped like a circle. Sizes range from ½” to 3”. 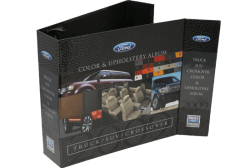 Paperboard Binder | A thick paper-based material, paperboard binders are ideal for leave-behind pieces and presentation folders. 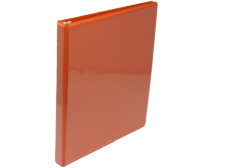 Poly & Rigid Plastic Binder | A binder made from one solid sheet of durable plastic. 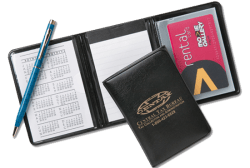 Ideal for guidelines, instructions, handbooks, manuals, and product catalogs. Ring Boosters | Levers on opposite ends of a ring mechanism used for opening and closing. Prevents damage to the rings. Ring Capacity | The size of the ring. See common questions below for instructions of how to measure the size of your rings. 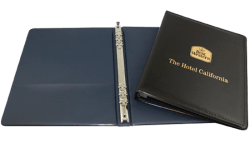 Sealed & Stitched Binder | Utilizing a high-quality vinyl cover material wrapped over board, forming a turned edge.Ideal for executive/leadership events and portfolios. Sheet Size | The size of the paper and/or tab going inside of the binder. 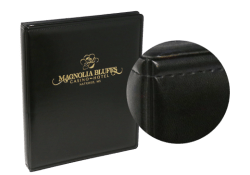 Our binders in our sample kits have a sheet size of 8.½“ X 5.½”. The industry standard is 11” X 8.½“. Spine | Side of the binder where the rings are typically applied to. 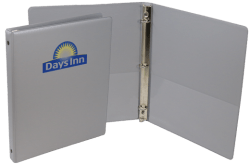 Straight D-Ring | Resembles an original letter D.
Turned-Edge Binder | Using a rigid board, cover materials are glued around the inside edges. 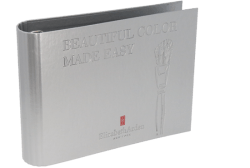 Long-lasting binders ideal for portfolios, proposals, presentation, and product sample displays. Turned & Stitched Binder | Binders featuring turned edges and decorative stitching. Ideal for brand messaging and corporate communications. Vinyl Binder | Vinyl heat sealed around rigid board. 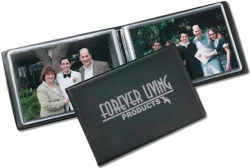 Ideal for document storage, handbooks, manuals, and product catalogs. Q: How do I measure my ring capacity? A: Measure from one side to the other with o-rings and along the straight edge for d-rings. Q: How many sides does a binder have? A: Most binders have 3 sides which include the front and back covers along with the spine. Stay up to date for additions to our glossary, blog and everything going on with The Dimensional Group by subscribing to our mailing list.